Click HERE to see our Citrus Availability Calendar! Buddha�s Hand Citron�also called Hand of Buddha, Fingered Citron, and even �Bushukan� in Japanese. Even if you can't decide what to call it, there is no argument as to it�s exotic nature. The Buddha�s Hand Citron is believed to have its origins in southwestern China and northeastern India. 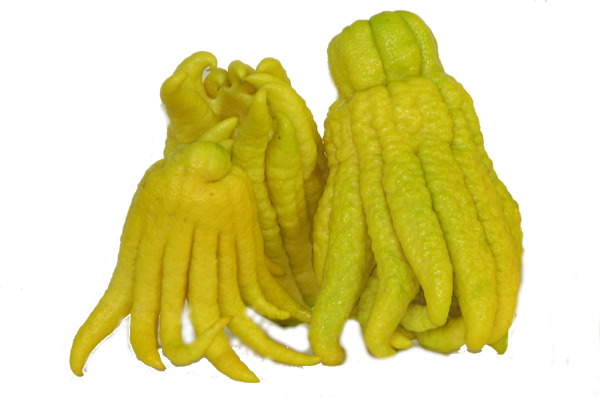 This odd, squid looking, citron is not necessarily in demand for its eating characteristics (although many skilled and creative cooks have figured out how to use this unusual citrus fruit) as much as it is prized for it�s fragrant attributes and religious symbolism. Both the Chinese and Japanese use the Buddha Hand�s intense floral and citrus aromas for creating harmonious and pleasing scents inside the home. Also, when given as a gift (usually during New Year�s celebrations) it is believed to usher in good luck for the upcoming year! They are also commonly used as religious offerings and found in Buddhist temples. It has a very thick rind, and in fact is mostly just rind with very small (if any) amounts of flesh inside. Buddha�s Hand Citron is both juiceless and for the most part contains no seeds. However, you can use the Buddha Hand in both food and drink recipes where regular orange or lemon peel or zest is called for. The aroma is both very distinct and exotic, which makes for quite the conversation starter. So whether you cook with its zest, add it to drinks, use it to add pleasing scents to your special room or your entire home, give it as a gift to friends, relatives or even "Higher Up", there is no question, that this Citron is the "Hands Down Winner� in the world of exotic, Specialty Citrus. When are Buddha's Hand Citrons available? Buddha's Hand Citrons have a rather short harvesting season. They are typically available from September thru February. Due to their limited quantities and short season, annual market pricing will also vary from season to season. Better hurry, they won't be around long! Call Pearson Ranch at 1-888-667-2643 to check on availability. Buddha's Hand Citron comes in a pack of 5 "hands"